Black Diamond 25-Line Slot Machine - Casino Answers! Black Diamond is a 5-reel, 25-line video slot developed by Top Game, featuring a wild symbol, a free spins feature and bonus wins. You can play the Black Diamond video slot at Bovada. The Black Diamond casino game is a penny slot. Bets on the Black Diamond slot machine are $0.01, $0.05, $0.10, $0.25, $0.50, $1, $3 and $5 per line. You can select up to 25 lines. You can make bets up to the maximum total bet of $125 per spin. Black Diamond has a very good betting range that would suit all different types of casino players – from casual players to high rollers. To play the Black Diamond slot game, select your bet and press the “Spin” button. 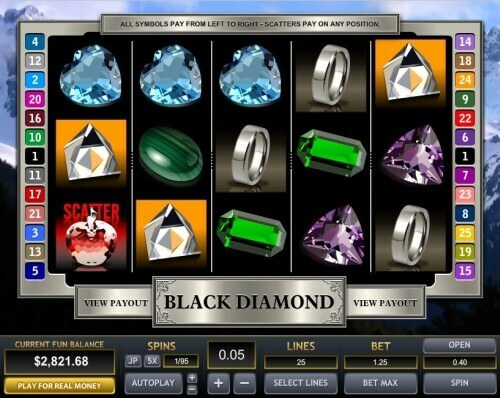 You can also press the “Bet Max” button to play all 25 lines on the Black Diamond online slot. The top-paying symbol on the Black Diamond video slot is the Yellow Gem symbol. 5 of a Kind of the Yellow Gem symbol will pay out the 6000 coin top jackpot. The second highest paying symbol is the Red Gem at up to 1000 coins. The scatter symbol on the Black Diamond video slot is the Ruby symbol. Land the Ruby symbol on reels 1 and 5 and win 10 free spins. You can trigger the free spins feature at the same time as the bonus game. You can win lots of free cash from Black Diamond’s free spins feature when you play at Bovada! When Gold Bar symbols appear on reels 2, 3 and 4 of an active payline, you will win a special bonus prize. This is a difficult feature to trigger, but if you get it, you will be awarded with a sizable prize. The Black Diamond slot machine has a basic autoplay mode. Press the “Auto Play” button to access the autoplay controls. You can use the “+” and “-” buttons to select anywhere from 5 to 95 autoplay spins (in increments of 5). Press the “Start” button to begin the autoplay mode. To stop the Black Diamond autoplay mode at any time, press the “Stop” button. 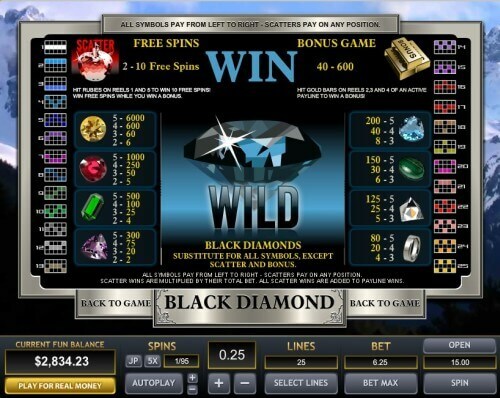 Black Diamond gives you free spins and bonus prizes, not to mention the Black Diamond wilds and a 6000 coin top payout. The main downside is that because the bonus symbols have to be on an active payline, it does take a while to trigger the bonus game. You can play the Black Diamond video slot when you sign up and make your deposit today at Bovada! Can USA players play the Black Diamond casino slot? Yes, American players are welcome to play the Black Diamond slot machine at Bovada.